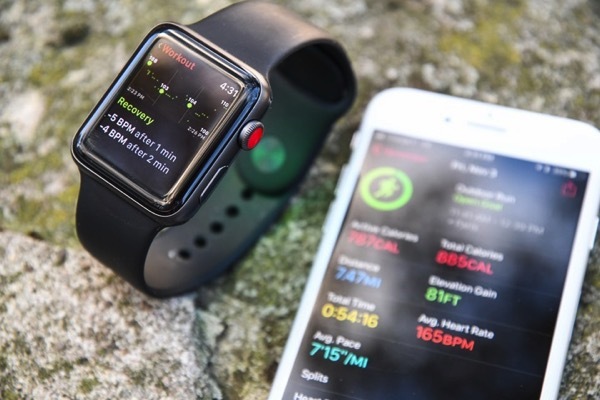 Triathlete Ray Maker, more commonly known as DC Rainmaker, has just published a comprehensive review of the Apple Watch Series 3 from the point of view of athletic training and fitness, while also comparing it to other leading sports watches and smartwatches. He highlights how the new watch still has the the same heart rate sensor and GPS capabilities as the Apple Watch Series 2, with most of the new features actually coming with watchOS 4. He lines up the Apple Watch Series 3 LTE with the Fitbit Ionic and Garmin Vivoactive 3, the three most popular fitness focused watches in the market. He then goes on to compare the heart rate and GPS accuracy of the three watches, noting that although the GPS on Apple Watch is not spectacular, it is not bad either. While the Apple Watch 3 is roughly on-par with some other mid-range GPS watches, he suggests that at the start of a workout, it is best to wait a bit outside, away from your phone to ensure it gets GPS from the very beginning. “Finally, a brief word on cellular capabilities. I bought the cellular edition, largely in thinking that I might end up using those capabilities, primarily in running. But I found that over time I didn’t actually use them much. On the cycling front, I always have my phone in my back pocket anyway. And in running, well, I didn’t much care what was going on in the outside world. I will note that getting the cellular pieces set up on launch day/weekend was kinda messy, and required multiple attempts with ATT (my provider). But once set up it worked well enough in day to day scenarios. However, it broke again when I went to Canada (so I fixed it again), and then it broke again when I went overseas to France (and once again, I had to fix it). He concludes by saying that even though the main strength of the Apple Watch as a fitness device is the app ecosystem, it’s also its main weakness, since Apple itself has made relatively small enhancements to the native fitness features year over year, compared to any of the big sport watch makers. To read the lengthy review in its entirety, click here.